Once you have made the decision to undergo breast augmentation, selecting the implant that will achieve your unique cosmetic goals can seem like a difficult decision. For this reason, our breast augmentation surgeon, Dr. Neil J. Zemmel, spends a significant amount of time getting to know his patients’ individual aspirations and concerns. During a thorough one-on-one breast surgery consultation, Dr. Zemmel will talk with you about the advantages of each implant option to help ensure you select an implant that can meet all of your wishes and expectations. Before the day of your breast augmentation surgery, you will have several opportunities to try on a variety of implant types as well as view virtual renderings of possible results via our VECTRA® 3D imaging technology so you feel confident in your final decision. Dr. Zemmel believes in a natural, proportional, and balanced look. You will be fitted with demo implants at least two times before surgery. Dr. Zemmel will guide you through the fittings to ensure your implant choice meets all of your cosmetic goals. By offering various breast implant “profiles,” you can select the precise degree of forward projection to create your desired look. With four profiles to choose from, Ultra High implants project the farthest from the chest while Moderate implants will create the most modest profile. Dr. Zemmel will make recommendations, taking into account your unique body frame, so your breast augmentation results look full, youthful, and natural. However, your breast implant profile decision should ultimately be based on your individual aesthetic preferences. All breast implants consist of a silicone rubber shell that is then filled with saline or cohesive silicone gel. Both materials can be used to create beautiful, natural-looking results. However, there are distinct differences between implants that are filled with saline solution and implants that are filled with silicone gel. Consistency: Some women select silicone implants because these implants tend to feel more natural to the touch. Particularly for thinner women, a silicone implant is more likely to give a texture that closely resembles a natural breast. For women who have thicker soft tissue and muscle of the breasts, a saline implant placed beneath the muscle can also give a relatively natural result. In general, the thicker the tissue covering the implant, the less the texture differences between saline and silicone. Cost: Silicone implants are more expensive than saline implants, depending on the specific implant you choose. Saline implants can be a more economical decision for those seeking breast augmentation within a limited budget. Filling Recommendations: When silicone implants are inserted into the breast pocket during surgery, the implant is already filled to the optimal level. For saline implants, however, the silicone rubber shell is empty. During the procedure, this shell is then filled with a sterile saline solution. Each saline implant size has a minimum, normal, and maximum fill volume. To provide the most natural results possible, Dr. Zemmel will typically fill saline implants to their maximum level or even slightly overfill the implant. This approach to filling saline implants can also reduce the risk of rippling around the outer edge of the implant as well as reduce the chances of a rupture. Dr. Zemmel believes the fill level of a saline implant is crucial for long-term success and the most natural look possible. Rupture Rate: Both types of breast implants have low rupture rates, though silicone ruptures occur less often than saline. When saline implants rupture, it quickly becomes noticeable as the implant deflates. Silicone implants, on the other hand, do not leak, making it difficult to detect a rupture. There is no scheduled maintenance for implants. Therefore if you have no problems or issues, no rupture or significant shape change, maintenance is not required. Silicone implants are statistically less likely to rupture than saline implants. Saline implants have a rupture rate of 1.8% per year; silicone implants have a rupture rate of 1% six years after surgery. However, in addition to rupture rates, there are still advantages and disadvantages to consider in regard to the lifespan of your implants. Saline Rupture: When a saline implant ruptures, the implant usually develops a small crack in the outer rubber shell. The saline then leaks out and your implant will deflate causing the breast to become smaller. The saline solution is completely harmless and is rapidly absorbed by your body. The rupture is obvious within a day or so of the break. As a result, you will know almost immediately when the integrity of a saline implant has been compromised. Occasionally, the saline fill valve may leak causing a slow deflation over several weeks. Patient usually notice a slow shape change over time. In either case, Dr. Zemmel will see you immediately and schedule you for your breast implant revision for a replacement. Silicone “Silent Rupture”: Periodic self-examinations for any sign of a possible rupture will aid in early detection of any abnormality. If you do discover a change in the shape or position of your breast implant, you should seek a consultation with Dr. Zemmel. 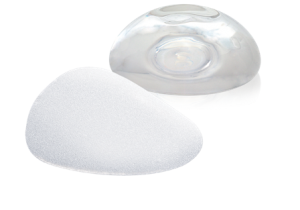 Because silicone implants are composed entirely of cohesive gel, the shape of these implants is stable even in the event of a shell rupture. The outer implant shell, however, may rupture similarly to a saline implant. If there is a rupture of the outer silicone shell, the gel stays in place and is designed not to leak. The gel itself is non-toxic and does not cause any systemic or body-wide diseases. Because there is no sign or symptom of a silicone rupture, you will need to undergo periodic imaging of your breast. This essentially takes a photograph of the implant and examines it for rupture. The FDA recommends that women with silicone implants receive periodic MRIs to ensure that their implants have not ruptured. Dr. Zemmel will thoroughly discuss his recommended imaging schedule with you during your consultation. In the event of a saline or silicone implant rupture, Dr. Zemmel recommends replacement of the implants. Dr. Zemmel advises to always replace both implants at the same time. Usually the original incision is used, so no new scars need to be created. The breast is then re-entered and the old implants are removed. Dr. Zemmel typically reopens the upper portion of each pocket (superior capsulotomy) and will perform other pocket adjustments as needed. Patients may also opt to change implant size. The new implants are then placed via the no-touch technique and the incisions closed with absorbable sutures. In general, an implant exchange procedure is less invasive than the original breast augmentation since the pocket has already been created. The operative time is much shorter since the pectoralis muscle has already been raised and is healed in its new position. This allows for a much quicker recovery time with minimal downtime. Implants that have a textured surface were designed to reduce the likelihood of capsular contracture—a hardening of scar tissue around the implant. Capsular contracture is one of the main risks that many women wish to avoid after breast augmentation, and textured implants have been shown to significantly reduce this risk. However, traditional textured implants can also increase the risk of rippling around the implant and can even make implants more prone to rupture. The highly cohesive Natrelle® 410 textured gummy bear implants, however, do not hold these same risks as other textured implants since they are form-stable. Dr. Zemmel typically uses either smooth implants or textured gummy bear implants at his practice, as he believes the risks of other textured implants often outweigh their benefits. Implants with a smooth surface allow the implant to move naturally within the breast pocket and reduce the likelihood of post-surgical rippling, while gummy bear implants are highly cohesive and, therefore, do not shift or pose much risk of rippling. Dr. Zemmel believes smooth-surface implants or highly cohesive textured implants yield the best long-term results. Anatomic breast implants, also known as “gummy bear” implants, are made of a form-stable gel that is shaped like a teardrop and more closely resembles the shape of a natural breast. Since the upper pole of these implants is tapered, the final results tend to look less “overdone” than many other implant types. Anatomic implants can also be particularly beneficial for women with very low natural breast volume who could benefit from a more sculpted implant. However, round implants certainly still have their advantages. 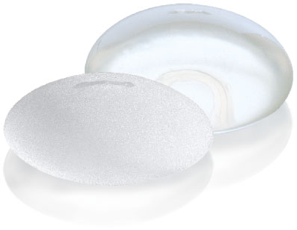 Due to their shape, round implants can move freely within the breast pocket, allowing for more natural movement. If a shaped implant accidentally rotates in the breast pocket, the breast can immediately take on an unnatural look. In addition, round implants may cause less rippling than certain shaped implants. Dr. Zemmel can help you weigh the pros and cons of each type of implant to help you decide which can achieve the results you desire. AAfter an initial breast exam, Dr. Zemmel will recommend a number of breast sizes that can achieve your cosmetic goals. Using a form-fitting shirt with the demo implants, you can get an idea of how your new figure may look after breast augmentation. Dr. Zemmel suggests trying on a number of different sizes to narrow down your options and help you make an educated decision. Though a number of patients at Dr. Zemmel’s plastic surgery practice choose an implant size in the B cup to DD cup range, he has found that nearly 80% of women select a C cup. However, breast implant sizes are measured in standard volume units (ccs), as opposed to the cup sizes used by bra manufacturers, which are not standardized. Since breast implants use a standard unit of measure, you can be sure that the final results of your breast augmentation are exactly the size you have selected during the consultation process. Navigating all of the decisions involved in selecting the best breast implant option for you is ultimately a very personal choice. However, Dr. Zemmel makes himself available as a resource for you. With his extensive experience in breast augmentation, he listens to his patient’s individual desires and expectations to help them make a well-informed decision. You should understand that neither silicone nor saline implants are lifetime devices. Like any other man-made device, they have a predictable lifespan. You should expect to replace your implants at least one time during your life, and the average replacement time is approximately 15 years after implantation. We want to ensure your safety and satisfaction to the best of our ability. However, patients should expect to replace their breast implants at least once, as discussed above. To learn what coverage includes for Natrelle (Allergan), Sientra, and MENTOR breast implants, see the details below. Although no breast implant is expected to last an entire lifetime, the warranty programs make sure your implant repair or replacement is as fast and easy as possible when and if you need it. Warranties may slightly vary depending on the date of your breast implant procedure. While breast implants have an extremely high satisfaction rate, many people worry about the safety of them. This is especially true of silicone implants, which were taken off the market in 1992 to undergo further study, only being available for breast reconstruction after cancer. After reviewing the research and determining silicone implants were not connected to serious disease, the FDA approved certain types for sale in 2006. All implants available today have and continue to undergo FDA studies to evaluate their short- and long-term safety. While research has shown that breast implants are not linked to health problems in the vast majority of women, patients should be aware of breast implant associated anaplastic large cell lymphoma (BIA-ALCL)—a form of lymphoma that can develop around implants. BIA-ALCL is extremely rare and, when caught early, is highly treatable with implant removal..
Dr. Zemmel makes patient safety his top priority at Richmond Aesthetic Surgery, and he is committed to only offering proven and trusted solutions. More details about the safety of breast implants will be discussed in detail with you during your consultation, at which time Dr. Zemmel will go over the possible risks and complications of your surgery. You are encouraged to ask questions and express any concerns you may have, so our team can help you make an informed decision about your care. In general, silicone implants tend to cost more than saline implants, making them a more affordable option for some individuals seeking breast augmentation. The best option for your needs and lifestyle can be recommended during your breast surgery consultation with Dr. Zemmel. During this appointment, he will also provide you with a cost quote based on the specifics of your treatment plan. Breast augmentation financing options can be explained to you if you are interested in turning your total procedural cost into smaller monthly payments. Additionally, Dr. Zemmel offers cosmetic surgery insurance with CosmetAssure® for patients who wish to obtain additional coverage for rare complications that can occur. If you have any questions about CosmetAssure®, financing, or what is included in your cost quote, please don’t hesitate to ask Dr. Zemmel or contact a member of our staff. *The average cost of the breast implants procedure listed above includes the surgeon’s fee—other expenses related to the anesthesia and operating room facilities are not factored in. Breast implants should not interfere with a woman’s ability to breastfeed. If they were able to nurse before their breast surgery, they should be able to afterwards as well. With this in mind, it is important to seek a board-certified plastic surgeon to ensure the procedure is carried out safely and properly, minimizing the risk of complications. When placed in the submuscular position, breast implants do not interfere with mammograms. Mammographers perform special views, called Eklund views, on all women with implants in order to visualize all of the breast tissue. When visiting your clinic to receive a routine mammogram, inform your mammographer of your breast implants to ensure they adjust the process accordingly. Despite the fact that patients with implants require a special view, this should not affect your ability to receive a clear reading. There has been extensive medical research that ultimately shows breast implants are not associated with a higher risk of breast cancer. With this in mind, if you ever notice any changes in your breasts, talk with your doctor to determine if more imaging should be performed to evaluate your breast health. If you plan to breastfeed in the future, you may want to discuss this with your surgeon, as they may recommend a specific incision technique that further ensures the mammary glands are not affected. In addition, your surgeon may advise the implants be placed under the chest muscle to minimize contact with breast tissue. To learn more about our breast implant options, or to schedule a consultation with Dr. Zemmel, please contact our office today.